Our creative studies offer, which is core to our ethos, encompasses Art, Design and Technology and Drama. These subjects offer invaluable opportunities to develop the skills of self-expression through the creation of artefacts and performance. Not only of great worth in their own right, these skills transfer well to other facets of human life. Students learn organisational and planning skills and most importantly, confidence in their own decision making and capacity to develop and present their own ideas and concepts. Our creative subjects occupy around one fifth of the lower school curriculum. The Faculty offers GCSEs in Art, Art Textiles, Drama, Food and Nutrition and Design and Technology. At Advanced Level the comprehensive offer incudes Advanced Level Art, Art Textiles, Drama, Design and Technology, Film Studies and Photography. In Year 7 students are offered experiences in a wide range of materials and techniques, including drawing and painting, mixed media, collage, digital media and graphic design. The Key Stage 3 curriculum is specially designed to give our students a rich art experience and prepare them for the rigors of our GCSE courses. In Year 7 Students work on individual assignments based on ‘The Natural World and Environment’ that develop and build into one extended project. Projects all begin with Observational DRAWINGS, alongside the RESEARCHING of work by artists and designers, learning to analyse work and use this to inform their ideas (UNDERSTANDING). They then learn and EXPERIMENT with a range of techniques and media and use this to develop creative DESIGN IDEAS (PREPARATION). All projects culminate in a FINAL OUTCOME (PRODUCT). In Year 8 students are offered experiences in a wide range of materials and techniques, including drawing and painting, mixed media, collage, textiles and graphic design. The Key Stage 3 curriculum is specially designed to give our students a rich art experience and prepare them for the rigors of our GCSE courses. In Year 8 Students work on individual assignments based on ‘Identity and Self’ that develop and build into one extended project. Projects all begin with Observational DRAWINGS, alongside the RESEARCHING of work by artists and designers, learning to analyse work and use this to inform their ideas (UNDERSTANDING). They then learn and EXPERIMENT with a range of techniques and media and use this to develop creative DESIGN IDEAS (PREPARATION). All project culminate in a FINAL OUTCOME (PRODUCT). Year 9 is a foundation year preparing students for their GCSE course in Fine Art. Between September and February students experience a mini GCSE project from personalised starting points. 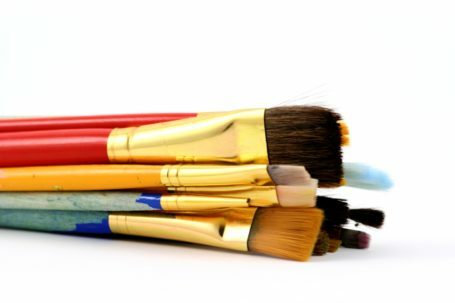 At Key Stage 4 the department offers students the opportunity to study for a GCSE in ‘Fine Art’. Key Stage 4 will begin after students have chosen their options in Feb of year 9. Over the 2 ½ year course, learners produce one extended coursework project that will make up 60% of their overall grade and in the January of Year 11 learners begin a 10-week exam project, culminating in a 10-hour exam. This exam project makes up 40% of their overall grade. During the Autumn term of year 11 learners conclude their extended personal projects. They focus on consolidating portfolios and designing meaningful and emotive final outcomes. This project makes up 60% of their overall grade. In the January of Year 11 learners begin an Externally Set Assignment. This is a project set by the exam board that culminates in a 10-hour exam. This exam project makes up 40% of their overall grade. During our A Level Fine Art course students will develop independent thematic projects based around a variety of starting points such as Sanctuary, Environments, The Self, Abstract and Conceptual Art and Still Life. Students develop themes that interest them and allow for sustained focus. At A Level Students begin with a series of workshops in order to develop knowledge, understanding, skill, accuracy and creativity. Students then develop independent portfolios of work working through the creative process from Records of Observation (DRAWINGS, PHOTOGRAPHS), ARTIST RESEARCH, EXPERIMENTATION, IDEA DEVELOPMENT and DESIGNING to the creation of a FINAL OUTCOME. During the Autumn term of year 13 learners conclude their extended personal investigations and related studies. They focus on consolidating portfolios and designing meaningful and emotive final outcomes. This project makes up 60% of their overall grade. In the February of Year 13 learners begin an Externally Set Task. This is a project set by the exam board that culminates in a 15-hour exam. This exam project makes up 40% of their overall grade.